I got a call today at lunch from my good friend and fellow Mac geek Kerry- there had been a new copy of Logic Pro X and Mainstage 3 released today. I was super excited, rushed home and started downloading it immediately. As I downloaded the large files, I checked email- over 30 of you had asked questions already about the new Mainstage, and I'd had over 1,000 times the number of hits on my free Mainstage patches page than I normally get each day. So I decided to answer a few of your questions while I wait for the download to complete. Q: is this update worth it? A: with the addition of a half dozen new/improved software synths (including killer vintage organ, electric piano, and clavinet plugins), improved performance, better layout knobs, and updated FX plugins (including bass amp modeling, new floor pedals, and a killer vintage compressor) , this seems like a total no-brainer. Also, it's really hard to argue with the price tag of just under 30 bucks- you can barely get iPad music apps for that price. Q: what is the best new feature(s) of Mainstage 3? A: as a keyboard player, I think it's easily the improved vintage instruments, especially the drawbar organ. This alone makes it worth it to me- Mainstage has always been weak in this area, and they've radically improved so much that I'd actually be comfortable using these plugins in a live setting for my main vintage sounds. Q: Is it backward compatible? A: yes and no. You can open any sound/set/project you've created in any version of Mainstage, although if you want to modify it and then save it, you'll have to save it as a Mainstage 3 file. Since you probably already have Mainstage 3, this will probably be a non-issue for most, although you'll want to make sure you're updated across all of your computers before you start swapping files over to the Mainstage 3 format. Q: how does licensing work across multiple computers? A: you can run Mainstage 3 on as many computers as you like, just as long as you have the computer's App Store registered to the same user. There's no unlock keys, dongles, or registration process aside from signing into the Mac App Store. If you've worked with other music software, you'll definitely find this simplicity a breath of fresh air. And at 30 dollars, it's inexpensive enough to buy multiple copies for band members. Q: How long does it take to download? A: at a little over 2.5 gigabytes, it'll take a bit of time to download. 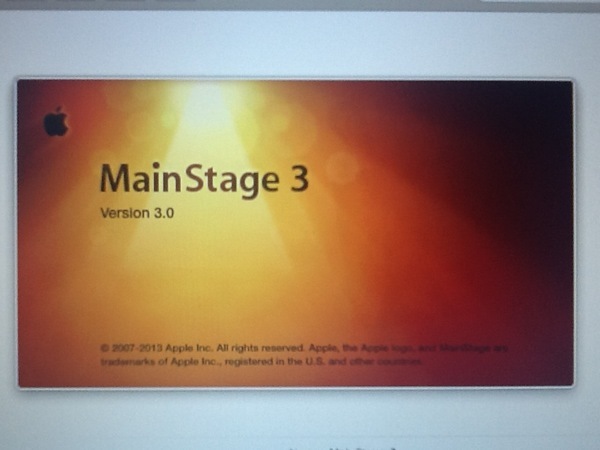 Apple has you download just the shell of the program first from the App Store, and then when you launch it for the first time, Mainstage starts automatically downloading the content. It says it should take about an hour to finish downloading all the content, but it's probably going to be about two hours for me on a broadband connection. Q: will your Mainstage worship patches work with Mainstage 3? A: absolutely- all of my worship patches will make the upgrade with no issues. Keep sending me questions if you have any about the new upgrade, and let me know what you think of it yourself. In the meantime, I'm going to start getting new templates ready using the new layout interfaces, upgrading patches, and writing a full review of Mainstage 3. Stay tuned! Older PostSelling Music is a Little Like Selling Newspapers. . .